Kirkcaldy forwards coach Kenny Fraser had nothing but praise for his side after this painful loss to Jed-Forest on Saturday. “We matched the league leaders in most phases of the game and gave them one of their toughest games of the season,” he said. “The very early penalty try and the yellow card and their second try were harsh set backs. “However, we showed what we can do by leading 20-19 at half time. “There was that advantage thing at the end where we were denied the chance of going for the winning score and that was disappointing. The game had seen an explosive start with less two minutes gone. The referee deemed that Kirkcaldy’s Rhys Bonner’s tackle had been dangerously high to stop a try being scored and awarded a penalty try before sending Bonner to the bin. Fortunes fluctuated with the lead changing hands several times. Two minutes from the end with Jed leading 33-32 the Blues appeared to have a victory chance when the referee’s arm went out for a Kirkcaldy penalty just inside the 22 metre line. Playing advantage, the Blues pack drove on for the try only to hear the official signal advantage over as the ball was knocked forward. Few agreed with him. From the resulting scrummage, Jed’s Ewan Scott streaked away to touch down at the other end with the conversion of the try denying the Blues even a losing bonus point. Although the Blues replied strongly to their early set back, the second score came Jed-Forest’s way. The home pack through a series of well controlled mauls took play to within touching distance of the Jed line only to lose control of the ball inches from the whitewash. Swift hands saw the ball quickly moved away from that contact and Jed full back Lewis Young was away on his own with no Kirkcaldy tackler near him. there was a sense that this was not going to be a runaway win for the league leaders. However, a defensive lapse by Quintan Sanft’s men gave the ball away and there was no stopping the speedy Gregor Young for a try converted by Gary Munro. Kirkcaldy put themselves under unnecessary pressure as their restart kicks which were often too long to be regathered. The visitors then had a handy attacking platform for counter attacking. In spite of this shortcoming the Kirkcaldy pack carried menace when they advanced. The ball had been recycled several time before a release let Rhys Bonner in for the second Kirkcaldy try. Continuing Kirkcaldy pressure forced Jed stand off Euan Scott into a deliberate knock-on for which he received a yellow card. Now with numerical advantage Kirkcaldy made the most ot it and before half time Smith kicked a penalty and Owen Bonner had his second try of the season a minute before half time which put the Blues a point in front at the interval. Much of the third quarter saw Jed force play to the posts at the pond end but solid defence kept them at bay until the 51st minute. A scrummaged penalty provided the ammunition for a pick up by No 8 Darren Gillespie to break loose for a score converted by Munro. The Kirkcaldy game picked up again and with the tempo increasing they responded well and a try and conversion from Smith restored the lead to 27-26. 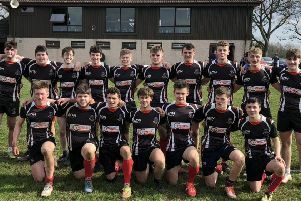 Jed’s restart gave their chasing forwards a chance to regain possession and within a blink Gregor Young had restored his side’s lead with Munro again adding the extra points. This enthralling game continued at pace with both sides using the ball well and testing the respective defensive lines. A Kirkcaldy penalty kicked to the corner set up Rhys Bonner for his side’s fifth try and reduce the deficit to a single point once more. The controversial ending came with the Blues being denied hard earned advantage and then conceded a scrummage from which Jed’s Scott went all the way and with the conversion being on target the Borderers were now eight points in front so denying the Blues a losing bonus point. In one of the last plays an assistant flagged an incident from which Kirkcaldy replacement Scott Barclay was issued with a red card. Kirkcaldy: F Smith, F Bruce, C Littlejohn, J Laird, O Bonner, G McKenzie, S Anderson, W Beattie, D Jennings, M Salt, C Wood, S Robertson, R Bonner, D Turner, J Pow. Replacements: G Queen, C Hamilton, S Barclay, R Brown, J Devine. Jed-Forest: L Young, E Stewart, G Young, M Mitchell, R Marshall, E Scott, G Munro, G Paxton, C Mackay. J Oliver, C Skeldon, G Law, B Roff, C Cowan, D Gillespie. Fife Trophy Centre Star Check: 3 Josh Laird, 2 Owen Bonner, 1 Craig Hamilton. Current standings: 11 Josh Laird; 9 Connor Wood; 6 Struan Robertson, Rhys Bonner; 5 Jack Pow; 4 Finlay Smith; 3 Matthew Harvey, Dayle Turner, Greg Wallace; 2 Conar Littlejohn, Alex Black, Owen Bonner; 1 Michael Harper, Jack Denton, Craig Hamilton.